SPOILER ALERT: The below interview contains spoilers from last week's episode of The Flash, "Failure is an Orphan." Like many Flash fans, we were pretty stunned after last week's shocking end-of-episode reveal. There’s a new, even more powerful Cicada threatening Central City…and it’s actually an adult version of Orlin's niece, Grace?! We were dying to know more about this new Dark Matter-powered meta. Why did she come back from the future? How did she come back from the future seeing as she's not actually a speedster? And what does her Uncle Orlin think of young Grace’s dark future? It's an exciting evolution of the Cicada storyline, which now really seems to be a twisted reflection of Iris, Barry and Nora's journey—an exploration of power, family and how the people you love impact the choices you make. We recently got a chance to chat with the woman behind our new Cicada, Sarah Carter, to talk about her experience joining the beloved show, Grace's motivations and the cathartic nature of playing a super-villain. Joining the cast of a show with such in-depth lore and fandom must have been a real experience for you. Were you already aware of The Flash before you joined? I was aware of it, so I was definitely excited to be a part of it. But I didn't follow the show, so I did have to do my research. I had to binge watch season 4 and 5 over one weekend, which was great! It made me fall in the love with all of the characters, so when I met them, I was already a fan. And the actors are so tight and positive and intelligent and generous and welcoming, so it was just a delight to walk on to that set. I wanted to honor what they had each brought to the show because it takes a village to have a show run for five years and have such a big following. How do you go about crafting a complex, yet empathetic, super-villain like Cicada? I was set up well, obviously, as the audience already has warmth for my character—for young Grace. They've seen what she's been through, they understand what has made her who she is, which is this broken heart. That was already there, so I didn't have to do anything, which was a real gift as I could just focus on where she is in the present moment. She's angry, she's vicious, she wants first and foremost vengeance for her parents—that's on a personal level. Then we come to realize that this is who she is. She's been trained by her uncle in the future to be an unstoppable killer. She has this shared mission with Orlin to kill every metahuman and that's what she's here to do. What's it like to just play a character who is so wholly angry and villainous? Well, I'm kind of kidding. I'm half joking! I will say it's fun to play a villain and just fully express whatever anger I may have to work with. I don't have that kind of anger, but I think that's why fandom followers are so into these villains a lot of the time because we all have that inside of us, but we don't get to play that in real life. We have to keep that in check! So, it's liberating to just get to really wear that human shadow. So, when it comes to Grace, why did she come back? What are her motivations? It's to get revenge for her parents. But she's also come back because Orlin has been "cured," and she wants to save him from falling into that kind of vulnerability again. He's her partner in crime and he's been weakened in her mind, so she has come back to get him strong again. Something we're all wondering is just how Grace managed to travel back through time from the future. She’s not a speedster. Something that seems to be becoming more present this season is the similar nature of Nora and Grace's stories, which both seem to share some pretty deep thematic threads. Was that something that surprised you? Yeah. I was really impressed with the complexity and depth of the writing. They go more in depth into that in the next few episodes, really exploring what makes people have the strengths that they have and what makes them have the weaknesses they have. The human heart and what drives it and what can make a killer, you know? That's been lovely and real and deep for a show like this. It's been a really nice surprise. Do you see any differences in Grace's Cicada from Orlin's? She seems stronger. Is she crueler? He created a monster. He taught me everything I know, but then I took it beyond that. When it comes to our power sets, because of where the Dark Matter affected me, I have more control over it because it's in my head, you know. So, I can tell you that much! How does Orlin react to adult Grace's arrival? Is he happy to see her? He's just so happy to see her alive and well, and she's also happy to see him. But they have different philosophies at this point because he has had all of that Dark Matter removed, so in a way, he's satisfied just to be with her again. He's dropped the need to complete his mission because he's seen the light of these metahumans—that really they're not all bad. Do you have a dream arc for Grace as her story progresses in the show? I am enjoying surrendering to this character, the writing is great so far. I've been collaborating quite a bit as we go, and they've been open to my ideas. I just really trust that the writers will take my character wherever will best serve the show and the story. Personally, though, I am an actor that no matter what kind of villain I'm playing—if I'm playing a villain—I always connect with their humanity. That's the only way to really make a character alive and truly powerful. So, of course, I am connected to young grace who is wounded, and I hope that there are more vulnerable moments in the future, but I also appreciate that there might not be and she might be an absolute sociopath. Which is also really fun to play! You fought aliens on Falling Stars, so as a last thought, what was harder? Fighting extraterrestrials or fighting superheroes? 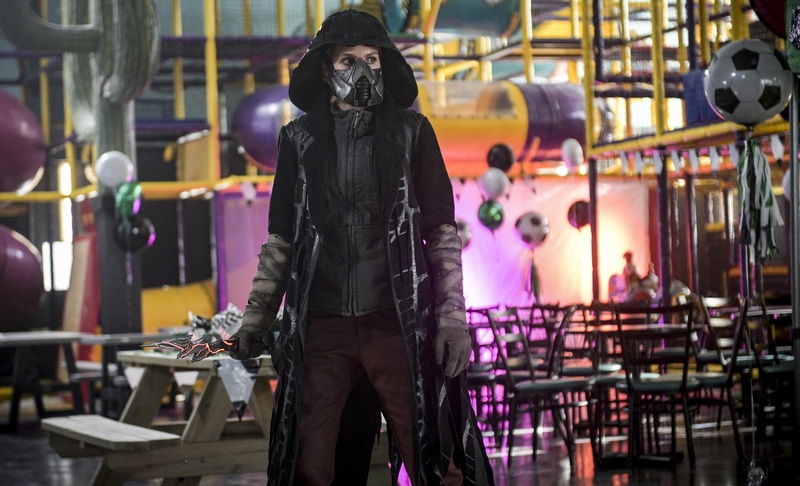 Look for Grace Gibbons to return in tonight's new episode of The Flash, "Time Bomb." The Flash airs Tuesdays at 8 p.m. (7 p.m. CST) on The CW.